The arrival of new puppies in the family is an exciting thing, whether it's a planned pregnancy or not, as a dog owner, you're going to be quite anxious about when your dog is going into labor. In this case, it happens at the airport just minutes before her flight. 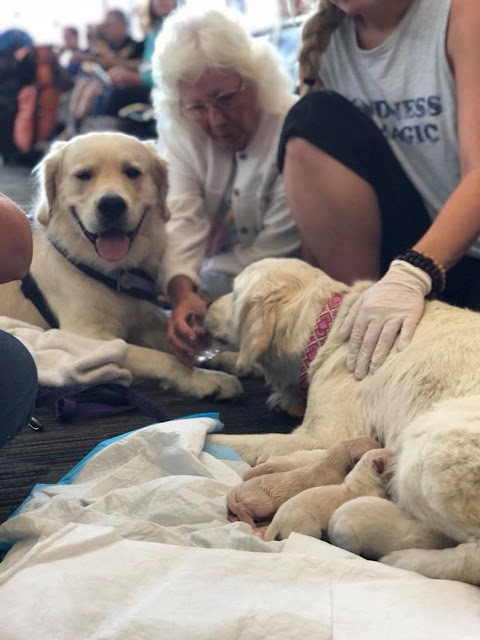 A 2-year-old Labrador and service dog whose name is Eleanor Rigby, Eleanor was waiting at the gate at Tampa International Airport on Friday to get to Philadelphia with her owner, Diane Vanatter, when she went into labor at Gate 80. Although Ellie was ready to wait, the other eight who were born immediately was not ready to wait another minute. Fortunately, rescue workers from Tampa firefighters were very close to help deliver the puppies. Paramedics Natalie Brown and Larry Glanton delivered seven male puppies and a little girl, with proud Doug Proud nugget Nugget (also a service dog) by Ellie’s side all through. Watch the video below to see the cute new arrivals.